Six-year-old Gretl Schmidt is on a train bound for Auschwitz. Jakób Kowalski is planting a bomb on the tracks. As World War II draws to a close, Jakób fights with the Polish resistance against the crushing forces of Germany and Russia. They intend to destroy a German troop transport, but Gretl’s unscheduled train reaches the bomb first. Gretl is the only survivor. Though spared from the concentration camp, the orphaned German Jew finds herself lost in a country hostile to her people. When Jakób discovers her, guilt and fatherly compassion prompt him to take her in. For three years, the young man and little girl form a bond over the secrets they must hide from his Catholic family. But she can’t stay with him forever. Jakób sends Gretl to South Africa, where German war orphans are promised bright futures with adoptive Protestant families—so long as Gretl’s Jewish roots, Catholic education, and connections to communist Poland are never discovered. Separated by continents, politics, religion, language, and years, Jakób and Gretl will likely never see each other again. But the events they have both survived and their belief that the human spirit can triumph over the ravages of war have formed a bond of love that no circumstances can overcome. The Girl From the Train is an incredibly beautiful book. In many ways it touched me very similarly to Anthony Doerr’s All the Light We Cannot See. It drew me in, made me smile and cheer, made me cry, made me angry. Through the story of Jakob and Gretz’s life, I experienced just about every emotion. Gretz is so strong, so resolute. Jakob is a hero. A very young man who carries many burdens and who is required to make hard choices. He chooses well. The Girl From the Train is a book that sent me out seeking information. I learned much as I was drawn into Gretz's story. The seeking and the learning was such an integral part of the story for me. Entwined as it were in the life of Gretz who was always learning, always adapting. 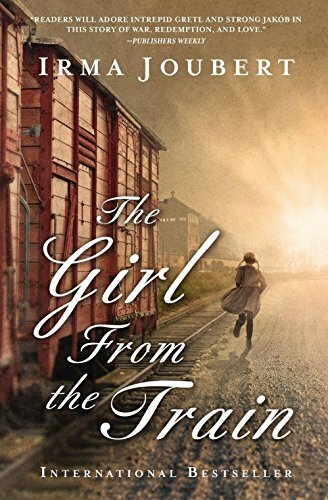 The Girl From the Train is a book about overcoming. It is a strong story of heartache and joy. War and peace. Gretz and Jakob were forced into dealing with the very harsh realities of life during a war. I must point out another harsh reality. There are children right here in the United States living the traumatized life of an unwanted and abused child. I am an adoptive mother of four beautiful, amazing, overcoming foster children who suffered great pain and trauma just as Gretz did. I have a number of friends who have also adopted children from foster care or overseas who also struggle to cope with their abuse. These children have overcome so much and are absolutely incredible yet as Gretz, they will carry their trauma and the effects of it throughout their lives. I wonder... Is there much of a difference between a child traumatized by war and the loss of loved ones as opposed to a child whose loved ones express hatred towards them and cause them physical and emotional harm? Neither child will ever forget. For the war child, the atrocities of invasion and death linger. For the child of abuse, there is a very real betrayal by those who should love them most. These children will blame themselves for their parent's sins believing they deserved it for something they did. The hurt is different. Both are tragic. The Girl From the Train was translated from Afrikaans for which I am grateful. I can see why it drew the publisher and it deserves the time that was spent in translation. There are no awkward translation issues. If you didn’t know that it was translated you would never guess. I highly recommend that you pick up a copy. The Girl From the Train is a book that you truly should read for yourself. I received a review copy from BookLook Bloggers (Harper Collins Christian Publishing) in exchange for my honest and unbiased review. International bestselling author Irma Joubert was a history teacher for 35 years before she began writing. Her stories are known for their deep insight into personal relationships and rich historical detail. She's the author of eight novels and a regular fixture on bestseller lists in The Netherlands and in her native South Africa. She is the winner of the 2010 ATKV Prize for Romance Novels.